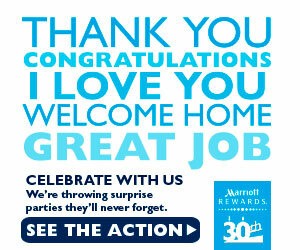 Come celebrate 30 years with Marriott and a special someone could be the lucky winner of a surprise party! Do you know someone who has done some incredible things lately? Perhaps someone who just got back from serving in the military, or perhaps it’s your very own Mom? Whatever it might be, write to Marriott and tell them the story! If they are selected, they will win the party of a lifetime! So start thinking of who you could enter and do it today! You could be the VIP Guest at that very same party! Good Luck!